I recently came across the above quote penned by renowned poet, David Whyte, just as the holiday season was beginning. The timing seemed more than relevant. I’ve heard from more than just a few people that 2018 has been a challenge. Add the holiday season and it can seem like a time of exhaustion as many Westerners are running from one item on their to do list to another and trying to fit it all in. I am no exception. Yet it’s the time of year when time spent with those I don’t see often enough is relished and when the invitation to attend events pour in. November was chock full of all of this and December seems to hold similar blessings. Rather than exhaustion though, it has been feeding my soul. 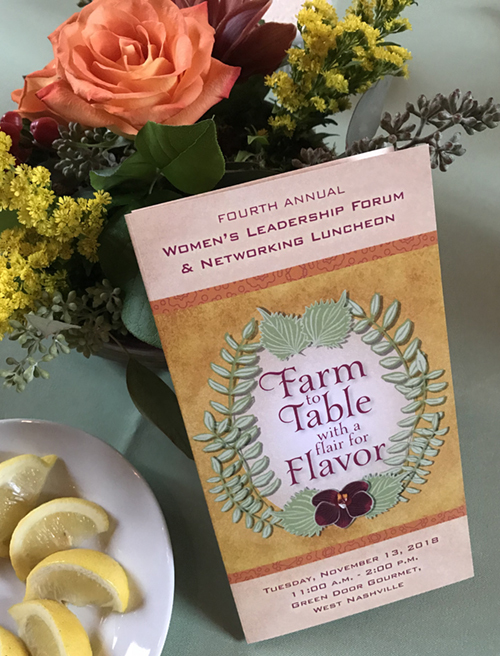 The branding for the JAST’s 4th Annual Women’s Leadership Forum and Networking Luncheon incorporated leaves herbs often used in the Japanese meals. 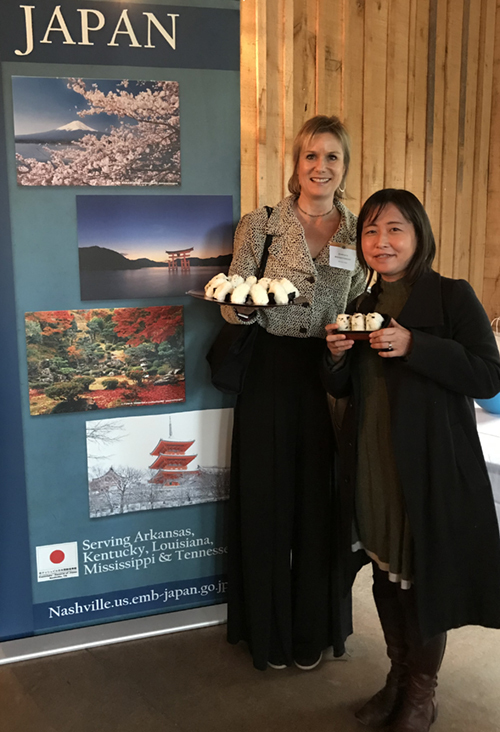 Japan-America Society of Tennessee’s Fourth Annual Women’s Leadership Forum and Networking Luncheon (which I also created the graphics for) was held at the lovely Green Door Gourmet and the panelists this year each had a connection to food. President and co-founder of Green Door Gourmet, Sylvia Harrelson Ganier spoke about how she created a place where delicious farm to table food could be served in a beautiful setting for a uniquely wonderful experience. Author and restaurateur Sarah Gavigan talked about the art of ramen, her Nashville restaurant Otaku Ramen, and her book Ramen Otaku. And Mayumi Uejima-Carr, President of Table for Two USA, shared how the non-profit came into being in Japan and is now spreading throughout many countries. She even taught attendees the art of making onigiri and how social media is helping to feed many who live in poverty by using the tag #onigiriaction. Mayumi Uejima-Carr, President of Table for Two USA, sharing the craft of making onigiri and how it is helping to feed those living in poverty. November also held the inaugural Nashville Design Week, “...a city-wide series of interdisciplinary programs and events to unite the design community, promote collaboration and idea sharing, engage the public, and elevate the impact of Nashville’s design economy.” While I would have liked to attend many more of the over 100 scheduled events, there was only time for a few with deadlines to be met. The panel discussion, Art Life Balance, Creative Work From Home presented some great tips and advice as well as a surprise discovery that one of the panelists was talented friend and musician, Jack Silverman with his lovely and equally talented wife in their beautiful home, featured in the latest issue of Nashville Interiors. 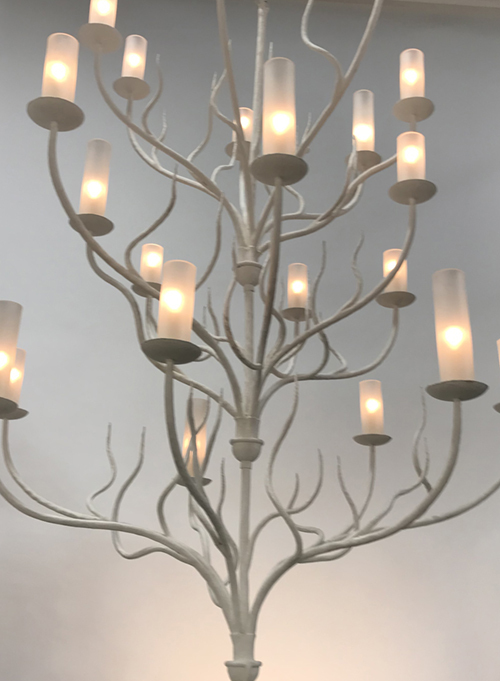 This is just one example of Ironware International’s beautiful craftsmanship showcased during the inaugural Nashville Design Week. Speaking of books, November’s inspiring events ended with a legendary figure: Annie Lebovitz, ‘one of the most influential photographers of our time.” The event marked the publication of a revised and expanded edition of Annie Leibovitz at Work. She shared stories about how her work evolved over time with quite possibly the broadest spectrum of characters and subjects that shaped her remarkable career (Allen Ginsberg, Richard Nixon, John Lennon and Yoko Ono, Keith Haring, Queen Elizabeth II, her family, just to name a few). Looking over my calendar of events from November at first glance felt exhausting but I must admit that it all evaporated as people spoke about the things they do wholeheartedly with their lives. These speakers all discussed how the creative life can be one of hard work and hard knocks and yet provide some of the greatest rewards imaginable. It was another reminder that I wouldn’t trade any of it. I simply love anything I can do with a full heart and the creative spirit has met that criteria throughout my career. I am grateful for it all.